You can play many games as door prize games but I have chosen this fun and easy game for you that you can print using your home printer. I have created printables for this game in three colors, which are pink, purple and brown. These game cards are decorated with beautiful hearts and colorful border. Print it on card stock paper and Bride-to-be can keep it with her. How to Play: Take one print out of this game in any color that you like. 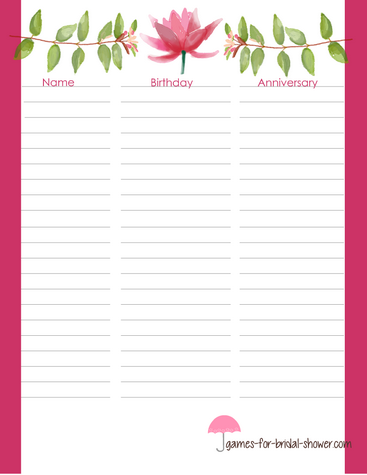 As your guests enter, ask each of the guests their name, their birthday date and date of their wedding anniversary if applicable. The guest whose birthday or anniversary date is closest to the date of wedding will be the winner. Click on the image shared above and right click and save the bigger image to your computer. You can also print this game card using a black and white printer but I'll recommend printing it in color. Try to write names of the guest in a beautiful way so bride-to-be can keep this game card to keep a record of all the upcoming birthdays and anniversaries. If purple color matches your bridal shower theme more, print this game card with a purple border and lots of hearts. Ask bride-to-be which is her most favorite color among the three that I am offering and take a print out in that color.